We’d love your help. Let us know what’s wrong with this preview of The Genius of Shakespeare by Jonathan Bate. Who was Shakespeare? Why has his writing endured? And what makes it so endlessly adaptable to different times and cultures? Exploring Shakespeare's life, including qu Judgements about the quality of works of art begin in opinion. But for the last two hundred years only the wilfully perverse (and Tolstoy) have denied the validity of the opinion that Shakespeare was a genius. To ask other readers questions about The Genius of Shakespeare, please sign up. This is a very readable, thought provoking book. It is certainly a book for lifelong lovers of Shakespeare and yet, is also, due to Jonathan Bate's enthusiasm and his light-hearted approach, a perfect introduction to the life and work of the Bard for those who have decided its time to know more. Jonathan Bate surprised and amazed me. His writing style drives the narrative, which in some cases is quite detailed, forward at a steady pace. I devoured this book in a few days. He had me at the first section all the way through to the last page. "Yes, trust them not: for there is an upstart Crow, beaut Jonathan Bate surprised and amazed me. His writing style drives the narrative, which in some cases is quite detailed, forward at a steady pace. I devoured this book in a few days. He had me at the first section all the way through to the last page. "Yes, trust them not: for there is an upstart Crow, beautified with our feathers, that with his Tiger's heart wrapped in a Player's hide, supposes he is as well able to bombast out a blank verse as the best of you; and, being an absolute Johannes fac totum, is in his own conceit the only Shake-scene on a country." The stage is set, and the upstart Crow plans, learns, networks, and writes, and writes, and writes. In 1592-1594 the plague closed the theatre. This was quite beneficial because in this time, Shakespeare wrote his first two plays, and had a swashbuckling time. It was during this time, discussion turns to how in 1594 Shakespeare was able to buy in to the Chamberlain's men. This is all meticulously crafted in scholarly style by Bate, and when he delivers possible solutions to the mysteries: I knew he had a strong case. This develops through the politics, the work, the relationships, and most importantly, 'The Genius of Shakespeare'. We are then taken on the stage of Shakespeare, the international one, and how his ability to relate with all people propelled him to be loved like no other writer. It was his ability to love Nature and all life, which transcended him from a poet to an Icon. His legacy, unsurpassed, remains and remains the writer's / poet's standard of absolute artistic brilliance. This is a book that captured my heart, and will remain with me forever. There are so many books on Shakespeare, and I have no need to read another one. As well as being clear on the historical chronology, Bate is also properly focused on the dramatic genesis of these works and so perfectly-placed to skewer the bizarre and seemingly endless line of Anti-Stratfordians, or people who claim a third party wrote Shakespeare's works. (Some of them are even big names: Tolstoy, Freud, Mark Twain, Orson Welles…) The fundamental argument used is based on his supposed second-class education. It really is as vapid as that: it comes down to the fact that he was not one of the most-highly educated of his peers. But wait, right there's your proof: for Jonson to have written about Shakespeare as he did, warmly while chuckling at his "little Latin and less Greek" says everything. Jonson knew that Shakespeare was his main (and superior) rival, just as Shakespeare knew that Marlowe was his model to follow when starting to augment his acting activities with writing. Bate's section on the cues Shakespeare took from Marlowe, his contemporary with the university advantage, while shooting past him is breathtaking, truly worth reading. While Bate proposes that "Shakespeare was born as a dramatist by way of his strong (mis)reading of Marlowe, and that he matured as an author by grace of the (mis)fortune of his dramatic brother’s death", he also proposes that "the key gift which belonged to Shakespeare, but not to Christopher Marlowe, was experience as an actor." And, along those lines, his discussion of certain scenes from Shakespeare that show quite clearly that they could only have been written by an actor with a grammar school education - and not a peer of the realm or other academic figure without a theatre background - is well-nigh definitive. Put simply: "Many of the boldest of Shakespeare’s departures from his sources were injections of performance or self-conscious allusions to theatre." That was the part that could not be faked. It's fairly easy to fake courtly language or knowledge of kings, because many have access to those sources (doing something groundbreaking with them is something else). It was practically impossible in those days for a peer of the realm to fake knowledge of the theatre. Now, I would suggest, that part is a little easier, with our wall-to-wall coverage of actors and backstage plays/films, but still difficult when it comes to the telling details. There is also plenty of discussion of how Shakespeare may have been magnified by the paucity of works surviving from the time. Possibly there was more of a collaborative sense of putting on plays (rather like folksinging) that may have meant there were other great plays that could have tussled with the Shakespeare works. Still, the evidence of the references of the day that survive make it quite clear: people were astonished by the sheer quality and wide-ranging ambition of the Bard's plays. They were different, calling upon elements from many different works, dramatically innovative, full of crowd-pleasing and reader-pleasing moments alike. "Since the eighteenth century, Shakespeare has been admired above all for two things: the range of his characters and the inventiveness of his language. The two go closely together, for it was by investing so many of his dramatic persons with memorable language that Shakespeare animated more voices than did any contemporaries. And because he animated so many opposing voices, he has been able to speak to many later dispositions." "Philosophy was born with Plato, who regarded his enterprise as a rival one to that of theatre. Though it grew from the profoundly dramatic method of the Socratic dialogue, the Platonic pursuit of wisdom and of essence could not abide theatre’s implicit claim that everything is performance. By returning thinking to the performative mode, Wittgenstein was bringing to an end the centuries-long battle between philosophy and theatre. Giving up philosophy means acknowledging the superiority of theatre’s way of doing things". Another strong passage is Bate's discussion, focused on Measure for Measure, which looks at ambiguities of meaning and whether there can be either/or readings. One of the major figures in this debate in the 20th century was William Empson, still an undergraduate when he formulated his Seven Types of Ambiguity, who used his study in quantum theory to illuminate the truly human response to ambiguity, "Undecidability, as Empson perceived in that crucial passage of Seven Types, is a condition of nature, not a fallibility or predilection of the interpreting mind. In an aspectual world, Negative capability becomes comprehensible as a law rather than a mystery. The sonnets can be understood as both autobiographical and fictive, Hamlet can be seen as both iconic and elusive." This isn't your standard biography of Shakespeare - point of fact, it isn't a biography at all. It's more of an attempt to explain: why Shakespeare? Why is he considered the ultimate literary genius? Why does he occupy an exalted position scarcely rivalled by anyone else in any other field, let alone literature? What is it about Shakespeare and his work that we esteem so highly? Why has Shakespeare survived and thrived? Why does Shakespeare continue to appeal not just to new generations but othe This isn't your standard biography of Shakespeare - point of fact, it isn't a biography at all. It's more of an attempt to explain: why Shakespeare? Why is he considered the ultimate literary genius? Why does he occupy an exalted position scarcely rivalled by anyone else in any other field, let alone literature? What is it about Shakespeare and his work that we esteem so highly? Why has Shakespeare survived and thrived? Why does Shakespeare continue to appeal not just to new generations but other countries and cultures as well? One of the most interesting arguments Bate makes is on the very definition of the word 'genius'. Prior to Shakespeare the concept of 'genius' was more about a spirit, a personal unique spirit, and had nothing to do with creative endeavour and output and achievement at all. The gradual turning of the meaning to 'unparalleled and utterly unique brilliance' came about largely as a result of the need for some way to describe Shakespeare above all others. "The Genius of Shakespeare" is written in distinctly dry prose, features unusual critiques of various Shakespearean characters and plays, and doesn't seem to be dense enough for the Shakespeare expert yet nor is it enlivening enough for the novice. Conversely, Bate's analysis is intelligent and well-researched: how does one man go from citizen to great talent to idol of the Western world? Why must fools insist on denying Shakespeare's authorship of the plays, in the face of overwhelming evidence "The Genius of Shakespeare" is written in distinctly dry prose, features unusual critiques of various Shakespearean characters and plays, and doesn't seem to be dense enough for the Shakespeare expert yet nor is it enlivening enough for the novice. This isn’t a biography but is one of the best general introductions to Shakespeare and how we can think about his works that I have read. It would be perfect for both general popular readers and undergraduates, and takes an eminently – and refreshingly – sensible approach to issues such as the authorship controversy, canonicity, and ‘global Shakespeare’. 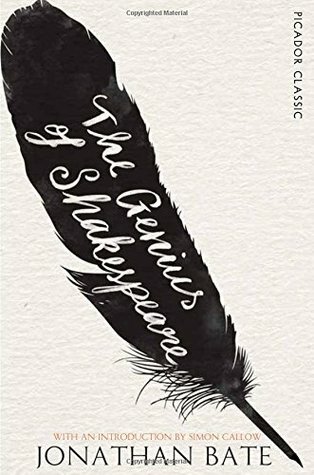 The ‘genius’ of the title is itself a play on words since genius in Shakespeare’s time meant not the transcendence that we give it but more a so This isn’t a biography but is one of the best general introductions to Shakespeare and how we can think about his works that I have read. It would be perfect for both general popular readers and undergraduates, and takes an eminently – and refreshingly – sensible approach to issues such as the authorship controversy, canonicity, and ‘global Shakespeare’. The ‘genius’ of the title is itself a play on words since genius in Shakespeare’s time meant not the transcendence that we give it but more a sort of characteristic disposition or natural character as taken from the Latin ‘ingenium’. Bate, then, offers a diverse, expansive and shrewd look at what Shakespeare means in the world. He unpicks the variety of ways in which Shakespeare has been received and appropriated as both the upholder of establishment values (e.g. by successive Tory governments) and as a liberal, possibly rebellious or unorthodox voice. not really a scholarly monograph, but not pop history, either. If you've been away from Shakespeare as long as I have, this is a great way to situate him and his work. My favorite takeaways were 1. the discussion of the Romantic fallacy of reading Elizabethan sonnets as autobiographical, and 2. the work on ambiguity, or the simultaneous validity of contradictory readings. An enjoyable and educational read! Clever, well researched and beautifully written, with one of the best refutations of the argument that Shakespeare did not, in fact, write Shakespeare. Interesting comparison with the prolific Lope de Vega, too. Excellent. Professor Bate will probably be a familiar face, or voice, to anyone on the 'Shake-scene' in the UK. You can hear him participating in Shakespeare-themed episodes of BBC Radio's 'In Our Time', he heads a University of Warwick MOOC on 'Shakespeare and his World', and amongst his many written accomplishments, he edited the Arden third edition of Titus Andronicus. This is such an engaging book. Because you don't read Shakespeare, he reads you'', we learn almost as much about Professor Bate as we d Professor Bate will probably be a familiar face, or voice, to anyone on the 'Shake-scene' in the UK. You can hear him participating in Shakespeare-themed episodes of BBC Radio's 'In Our Time', he heads a University of Warwick MOOC on 'Shakespeare and his World', and amongst his many written accomplishments, he edited the Arden third edition of Titus Andronicus. This is such an engaging book. Because you don't read Shakespeare, he reads you'', we learn almost as much about Professor Bate as we do about Shakespeare. If you want to know what a modern Shakespeare scholar is like, you could do worse than start here. In my readings of his works, Bate often 'proposes' things. Not out of diffidence - it comes across as polite, almost gentlemanly. So much better than the ponderous and condescending tones of MC Bradbrook or Frank Kermode ... in terms of what this tells us about Bate, I'd suggest that his mild-mannered speaking voice is matched by his general style. Whilst the other two authors obviously knew just as much, it's always more enjoyable to be spoken to, not at. What else do we learn? Plenty, in the same way that regular readers of my blog will have assimilated plenty about me from my ongoing intertextual and cultural references. Bate speaks with real eloquence and enthusiasm about how artists like Fuseli, Berlioz and Verdi interpreted the plays. I came away a little awestruck, to be honest, by the range of his knowledge. Another highlight was the occasional cheeky modern politics. And he's persuasive, encouraging me (quite kindly) to set aside my innate prejudice against Lurhman's Romeo + Juliet and give it a fair chance as an interpretation to be watched, not the bane of a teacher's life. Finally, I love the fact that he proposed another name for that coveted title of 'genius'. If you want to know who that might be, you'll have to read the book. This book blew my mind when I first read it and its still the book I recommend to anyone who wants to learn more about Shakespeare. The first 5 chapters look at Shakespeare in the context of his contemporaries, the rest of the book looks at how we look at him ever since. Heavily researched but extremely readable. I also have this book to thank for introducing me to Lope de Vega, another author who should be in the literature canon but because he wrote in Spanish, is not. I read this book for one of my study units at University. However, it has proven to be a really great read, not only for university purposes but even for myself as a Shakespeare lover to get more insight on his works as well as many debates that have risen on the 'genius' of Shakespeare. He could have gone further to Godel and Turing in the end. Lovely book in so many ways. I really like the tragedies and he discussed them in the second to last chapter. So many ideas in this book. Lovely. Scholarly and well-written, a very thorough introduction to all aspects of Shakespeare and Shakespeare scholarship. Tough in places but entirely readable and informative making me want to take to the plays either for s first time or a return visit after the detailed consideration in his part two. Recommended. "Shakespeare and Mozart are the archetypal Original Geniuses because the idea of original [unique, embodied:] genius emerged as a way of explaining the phenomenon of Shakespeare [long after his death:] and because Mozart appeared as a child prodigy at the precise historical moment -- the late eighteenth century -- when pure native endowment was becoming the vital test of true creative greatness. [. . . .:] It has been suggested that genius became a Romantic obsession because it was a conception "Shakespeare and Mozart are the archetypal Original Geniuses because the idea of original [unique, embodied:] genius emerged as a way of explaining the phenomenon of Shakespeare [long after his death:] and because Mozart appeared as a child prodigy at the precise historical moment -- the late eighteenth century -- when pure native endowment was becoming the vital test of true creative greatness. [. . . .:] It has been suggested that genius became a Romantic obsession because it was a conception that seemed to guarantee originality. [. . . . But, in line with Coleridge's idea of the poet's communality opposed to Wordsworth's of the poet's individuality:] by 'Shakespeare' we mean not an individual, but a body of work, and that body was, I argued in part one, shaped by many individuals -- by the dramatist's education and his precursors, by the actors of his company, by the audience without whom no play can be completed." This is an amazing book. It is not a particularly easy read, and was not what I was anticipating (I was expecting a book that explored the techniques, art, humor of Shakespeare). Mr Bate traces the history of Shakespeare in print, performance, and appreciation, through the ages. He explores how our sense of Shakespeare has changed over time, but also explores differences in interpretation of some of the plays and sonnets. The latter explorations were what I especially appreciated. The exploratio This is an amazing book. It is not a particularly easy read, and was not what I was anticipating (I was expecting a book that explored the techniques, art, humor of Shakespeare). I'm one of those people who belongs in the 'really should know more about Shakespeare' category. Are you frustrated by all the allusions to and quotes from Shakespeare you read without knowing the context? That's me. So I picked up this book to help fill in my lack of knowledge about the Bard and his works. It really tells more about Shakespeare and his influence than it does about his sonnets and plays. There's a nice section on the foolishness of the 'who wrote Shakespeare's plays' crowd, and I'm one of those people who belongs in the 'really should know more about Shakespeare' category. Are you frustrated by all the allusions to and quotes from Shakespeare you read without knowing the context? That's me. So I picked up this book to help fill in my lack of knowledge about the Bard and his works. It really tells more about Shakespeare and his influence than it does about his sonnets and plays. There's a nice section on the foolishness of the 'who wrote Shakespeare's plays' crowd, and nice examinations of how Shakespeare has been interpreted in the 19th and 20th centuries. I have to admit that there were places where I skipped paragraphs, and even pages, but I don't hold that against the author. He was offering necessary detail for his arguments, and I simply had more general interests. This is one of the better Shakespeare books on the market. I came to it having read Bate's book on John Clare previously and was pleased to join him on what is obviously his home territory. He makes the most comprehensive Stratfordian case I have read and is so convincing in his common-sense that you will come away wondering what all the fuss is about. The history of the reception of Shakespeare is comprehensive and illuminating. At times it seems like there could not be anything new to say about This is one of the better Shakespeare books on the market. I came to it having read Bate's book on John Clare previously and was pleased to join him on what is obviously his home territory. He makes the most comprehensive Stratfordian case I have read and is so convincing in his common-sense that you will come away wondering what all the fuss is about. The first half of this book was a page-turner. I didn't put it down. This was the portion that covered the actual documentary history of Shakespeare the man, as well as the authorship question, the influence of Marlowe, and Shakespeare the actor. The second half, which dealt with Shakespeare's legacy, had high points and low points. From Shakespeare as England's national poet (dull) to Shakespeare's characters as icons of our culture (interesting). Ran out of steam reading this. Traditionally evasive and esoteric for an academic's yet plenty of clarity in its interpretations and evaluations. Bate isn't swayed by one view. He considers and weighs up them all, however extreme they may be. A nice little book that presents the overall influence that Shakespeare has had on our life and times. A good, well-written resource: recommended. To be or not to be...I have to return to this someday when I'm more in the mood for that Shakespeherian rag. Jonathan Bate CBE FBA FRSL is a British academic, biographer, critic, broadcaster, novelist and scholar of Shakespeare, Romanticism and Ecocriticism. He is also Professor of English Literature at the University of Oxford and Provost of Worcester College, Oxford. A Man Booker Prize judge in 2014. He studied at the University of Cambridge and Harvard University. He has been King Alfred Professor of E Jonathan Bate CBE FBA FRSL is a British academic, biographer, critic, broadcaster, novelist and scholar of Shakespeare, Romanticism and Ecocriticism. He is also Professor of English Literature at the University of Oxford and Provost of Worcester College, Oxford. A Man Booker Prize judge in 2014.